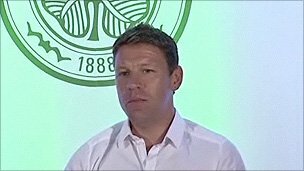 Celtic coach Alan Thompson has been banned from driving for 16 months and fined £600 after he admitted drink-driving following an Old Firm game. The 37-year-old was stopped by police on Kirkintilloch Road, Bishopbriggs, on the morning of 25 October last year. Glasgow Justice of the Peace Court heard he had been out drinking the previous night after Celtic had lost 3-1 to Rangers at Celtic Park. Thompson has a previous conviction for drink-driving dating back to 1996. The court was told that officers pulled over Thompson's Range Rover and he was arrested after he failed a roadside breath test. He was also originally charged with using his mobile phone while driving but prosecutors accepted his plea of not guilty to that charge. Defence advocate Paul McBride QC told the court that Thompson was ashamed of and deeply regretted deciding to drive that day. Sentencing the former midfielder, Stipendiary Magistrate Robin Christie told Thompson that he would be allowed to drive again after 12 months if he completed a drink-driver awareness course. Thompson returned to Celtic last summer as part of Neil Lennon's backroom team. He played a pivotal role in the Celtic team that reached the Uefa Cup Final in Seville in 2003. He later played for Leeds United and was on the coaching staff of Newcastle United before returning to Celtic.